Thirty years of studio teaching have underscored to Erik that notwithstanding the cliché, every student is indeed unique. 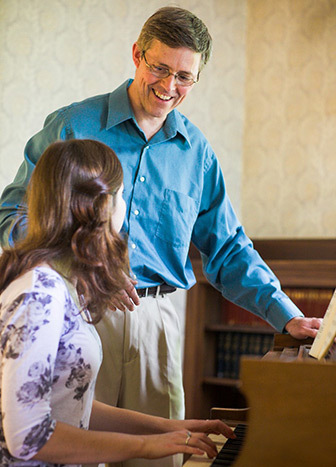 From the first lesson his fundamental goal is to ignite each student’s passion for music. Erik’s methods and materials are flexible according to each pupil’s specific needs and interests, and the changing dynamics inherent to individual progress and maturation. Whether in the classroom or the private studio, Erik communicates to his students the need to think critically and be active rather than passive learners. Information and ideas must not only be absorbed, but also tested and validated through practice. Erik prepares his students to face the challenges that inevitably occur in the practice room by teaching his students to set realistic goals, adopt effective and creative practicing techniques, and develop confidence right way. Along with the trust placed in his hands by his students comes a strong sense of responsibility, one that Erik welcomes as one of the most rewarding aspects of a teaching career. Few things are as satisfying as contributing to—and ultimately witnessing—a student’s successful achievement of his or her goals. See more about Erik Entwistle’s teaching experience.